After starring for two years on the track with state championships in the 1,600, Babcock showed that she could become just as proficient in cross country by going undefeated with wins at the Woodbridge and Orange County Invitational’s before taking the Southern Section and State Division II titles—the former with the equal-third fastest time ever run at Mt. San Antonio College and latter with the fastest time of the day to become the sixth fastest runner of all time at Woodward Park.. Sophomore and Junior all-state first team in 2005 and 2006. Christine Babcock (Woodbridge, Irvine)—Completed and undefeated season with Division II wins in the Southern Section and at State. Sophomore and Junior all-state first team in 2005 and 2006. Laurynn Chetelat (Davis)—Finished third in the Mt. San Antonio Invitational Super Sweepstakes race before winning the Sac-Joaquin Section and State Division I title after taking the Sac-Joaquin section race. Second in the Foot Locker West Regional and 16th in the nationals in San Diego. Claire Collison (Crescenta Valley, La Crescenta)—Second in both the Southern Section and State Division I races. Junior first team all-state in 2006. Katherine Dunn (Saugus)—Led the Centurions to the Southern Section and State Division I team titles, with fourth and sixth-place finishes, respectively, before placing fifth for the Saugus Club team that finished second. Vanessa Hancock (Brea, Brea Olinda)—Finished sixth in the State Division II race after placing second in the Southern Section final. Junior first team all-state in 2006. Rachel Lange (Crescenta Valley, La Crescenta)—Placed sixth in the Southern Section Division I final before improving to fifth in the State final. Deborah Maier (Ponderosa, Shingle Springs)—Won the Sac-Joaquin Section Division II title and then finished fifth in the State final. Sadee Martinez (Burroughs, Burbank)—Finished tenth in the State Division I race after placing eighth in the Southern Section final. Sarah Sumpter (Healdsburg)—Was undefeated through the state meet with wins at the Stanford and Mt. San Antonio College invitational’s as well as the North Coast Section Division IV race and the State final. Placed ninth in the Foot Locker West Regional and 22nd in the national meet. Kauren Tarver (Serrano, Phelan)—Closed out a great high school career finishing third in the State Division I race after winning the Southern Section title. She won the State Division II title as a freshman and sophomore and was second in Division I (with the same time as the winner) as a junior. Sophomore and Junior all-state first team in 2005 and 2006. Katy Andrews (La Costa Canyon, Carlsbad)—Placed 17th in the State Division I race after a runner-up finish in the San Diego Section. Kristin Arkin (Trabuco Hills, Mission Viejo)—Finished just 17th in Southern Section Division I final but peaked at State, placing 12th. Alisia Barajas (Vista)—Placed 16th in the State Division I race after finishing sixth in the San Diego Section final. Shelby Buckley (Corona del Mar, Newport Beach)—Finished third in the State Division III race after winning the Southern Section title. Jordan Burke (Placer, Auburn)—Placed seventh in the State Division III race after finishing second in the Sac-Joaquin Section final. Megan Fairley (Peninsula, Rolling Hills Estates)—Finished 11th in the State Division II race and fifth in the Southern Section final. Abbey Gallagher (Great Oak, Temecula)—Placed 24th in the State Division I race after finishing 11th in the Southern Section final. Keena Kohl (Esperanza, Anaheim)—Really stepped up at the State Division I race with a 15th place finish after placing just 26th at the Southern Section final. Nina Moore (Saugus)—Placed 25th in the State Division I race after finishing 12th in the Southern Section final. Caitlin Villareal (Norco)—Finished tenth in the State Division II race after placing seventh in the Southern Section. Ashley Beechan (Hemet)—Placed 20th in the Southern Section Division I final with an 18:08 but did not advance to state. Elizabeth Coe (Fountain Valley)—Season shortened by injury but finished well with a 27th place finish in the State Division I final after placing 18th in the Southern Section final. Allison Damon (Corona del Mar, Newport Beach)—Finished third in the Southern Section Division III race but had an off-day at State with a 33rd place finish. Krista Drechsler (Santa Barbara)—Placed eighth in the Southern Section Division II final in 17:57 but did not advance to state. Taylor Dutch (Lutheran, Orange)—Finished ninth in the State Division III race after a sixth place finish in the Southern Section final. Shelby Galan (St. Francis, Mountain View)—Placed 18th in the State Division II final after a runner-up finish in the Central Coast Section. Rebecca Habatmu (Prospect, San Jose)—Finished 14th in the State Division III final after placing third in the Central Coast Section. Meredith Robie (Redlands)—Placed 30th in the State Division I race after finishing 18th in the Southern Section final. Arianna Selix (Esperanza, Anaheim)—Placed 34th in the State Division I final after a 27th place finish in the Southern Section final. Natalie Sojka (Mt. Shasta)—Finished third in the State Division V race after a runner-up finish in the North Section final. The super runs started early for German and the Sac Joaquin star never slowed down on the way to stunning races up through the Section and State Meet, with an amazing 14:24 Course Record run during the Division IV State Finals at Woodward to destroy the 14:38 twenty year old standard. German was an inspiration to all statewide during his Fall efforts, with ‘run from the gun’ efforts that showed what a talented star with a fearless attitude could accomplish. To his credit it took a muddy course after a series of ‘freeway quick’ facilities and group of athletes who gave him some unaccustomed company that resulted in his first loss at the Foot Locker Nationals. The time on the clock at the finish line and his understandable collapse at the end of the State Meet Division IV run after the pressured build-up to record possibilities will remain as one of those most half dozen riveting memories for yours truly during a half century of watching race finishes in our sport. Gritty runner who made it an extra fun fall season. –Mohamed Abdalla (Willow Glen, San Jose-CCS) - Steady CCS star had a fine senior year, ending second in his Section and at State behind Attarian Division III. One of these races he is never coming back to the pack. –James Attarian (Dublin-NCS) - Gutty North Coast Star rolled through Section and State wins at his Division III level, then was a fine fourth in the Foot Locker West Meet and twenty-fifth in the nation at the Foot Locker Finals. –Steven Crum (Santiago, Corona-SS) - Hard working senior had a great year that closed with a seventh in the State Division I Finals after a sixth place in the Southern Section title run. –German Fernandez (Riverbank-SJ) - One of the great years in California history had all but the perfect close with a third place at the National championships for the Sac Joaquin star who blasted courses week after week during the Fall, ending with a stunning 14:24 run to set all All-Time Woodward Park course record at State. –Brett Hasvold (Fallbrook-SD) - Another with a great September to November series of races, and had to deal with the death of Coach Marty Hauck in September. Section Division I Champ and fourth in the State Meet at that level. –David McDonald (Vista Murrieta, Murrieta-SS) - leader of another fine new program out of the growing inland empire of the Southern Section, David was fourth in the tough Southern Section Division I Finals, and led his team to a third place at the State Meet with his eighth place run. –Anthony Solis (Barstow-SS) - Senior leader of the great Barstow State Division III Championship squad, Anthony was the Southern Section individual champ at his level, third in that Fresno finals run and was seventeenth in the Foot Locker Western Regional run. –Riley Sullivan (Trabuco Hills, Mission Viejo-SS) - Latest of the fine Trabuco Hills runners, Riley was a close second to Chris Schwartz at the Division I State Meet, was the Southern Section Division I Titlest, and ended top twenty in the nation individually in San Diego in December at the Foot Locker Nationals. –James Tracy (Del Campo, Fair Oaks-SJ) - Sac Joaquin star traveled the state this Fall and had a ton of great efforts this season. Section and State Division II Champ, the latter with an impressive last mile move. Just missed out on the National Finals as an individual and should have a great spring track season. –Brett Walters (Sultana, Hesperia-SS) - Southern Section high desert star was second to Sullivan in his Section meet, third at the State meet behind Fernandez and Riley, and closed the season out nicely with a twenty-ninth place finish at the Foot Locker Nationals. –Jose Alcantar (Hueneme, Oxnard-SS) - Closing down a fine prep harrier career, Jose moved from fourth in the Southern Section Division II Finals to a runner-up effort in the State Championship run. –Tyler Alvarez (Dana Hills, Dana Point-SS) - Part of the steady Dana Hills squad that raced to great winning team efforts in the Section and State Division I finals. Tyler was eighteenth at the State Meet and twentieth at the Southern Section Finals run. –Nate Beach (Acalanes, Lafayette-NCS) - Fine close to the championship season for the talented NCS star, with a runner-up effort at the Section level and fourth at the State Meet Division III. –Diego Estrada (Alisal, Salinas-CCS) - The strong Division I CCS Champ in the sport was thirteenth at the State Finals competition and had a Fall of fine competitions. –Talal Khan (Valencia, Placentia-SS) - Fifteenth in the State Meet Division I to lead his sixth place team, Khan was fifteenth in the Southern Section Division I contest, and thirteenth in the Foot Locker Western Regionals to finish a fine season. –Eric Kleinsasser (Crescenta Valley, La Crescenta-SS) - Latest of the great running family to rate headlines, Eric was nineteenth at the State Meet in helping lead his squad to a fine fourth place finish, and was twenty-second in the competitive Southern Section Championship DI Finals. –David McCutcheon (Murrieta Valley, Murrieta-SS) - Eleventh in the State Meet Division I to help lead his squad to a runner-up effort, David had a great year with a twelfth at the Southern Section Finals. –Chris Romo (Woodcreek, Roseville-SJ) - With his sixth at State led the fine Woodcreek squad that finished third Division II, and Chris had a fine series of Invitational level runs all across California during the Fall season. –Adrian Sherrod (Steele Canyon, Spring Valley-SD) - The San Diego Section Division II Champion raced to a fine fourth place effort at that level in the Fresno State Meet. –Brad Surh (Carlmont, Belmont) - Nation’s fourth fastest miler (4:10.42) had a fine Fall, with a second at the CCS Finals Division I and sixteenth at State at that level. Could help lead a cranking spring over four laps statewide. –Jeremy Acosta (Highland, Palmdale-SS) - Sub 15 at Mt. SAC for the Invitational and great series of regular season runs, then added fine twenty-fifth at the Foot Locker Western Regional. –Phillip Benavides (Alhambra) - Fine year of efforts, with a seventh in the tough Southern Section Division I Finals followed by a twenty-second at the State Meet at that level. –Ganbileg Bor (Jefferson, Daly City-CCS) - Great run to finish the local season with his CCS Division III run under the magic 15 minute barrier at Crystal Springs. Followed that race with a sixth at the State meet. –Matt Duffy (St. Mary’s, Berkeley-NCS) - Fine senior year had Matt follow-up his North Coast Section Division IV Championship win with a fourth at the State meet and twenty-first in the Western Foot Locker Regional. –Ryan Ernst (Arcadia-SS) - 4:24 1600 star stepped up to the three mile/5k distance in fine style this Fall and helped his Apache teammates battle all fall with local rivals Crescenta Valley on the way to his fine twentieth in the State Division I Finals. –Jeremy Grace (Dublin-NCS) - Training-mate of James Attarian at Dublin, Jeremy was third in the North Coast Section Division III Finals at his level and eighth at the State Meet to go along with a fine regular season. –Nick Kelley (Granite Hills, Apple Valley-SS) - Top ten statewide Division II, Nick had a fine fall for another of those fairly new greater inland empire/high desert Southern Section schools. Thirteenth in the Southern Section Finals at his level. –Kyle Lackner (Jesuit, Sacramento-SJ) - 2007 Jesuit HS leader was the Sac Joaquin Division I Champion in that very competitive area, and added a twenty-first at the State Finals while competing as an individual. –Alex Routh (Simi Valley-SS) - Fine runs at the section level, including a tenth place individually at the Division I level at close to 15:00 at Mt. SAC. –Alberto Solis (Big Bear-SS) - Stepped up to lead his high altitude based squad to the State Division IV title with his third place effort from the Woodward Park Finals. Southern Section champion, as he continues the great Big Bear string of individuals. Choices for these teams were made with preferences to late-season championship efforts, with some listed above not participating in the state meet competition while performing super at their grade level along the way. Three for Three and counting. Hasay has followed up her State Freshman and Sophomore athlete of the year honors with the same award in, this, her junior year. She opened her major invitational season with a win at Clovis and then followed that up with a win in the Mt. San Antonio College Grand Sweepstakes race in time of 16:42 to rank fourth (at that time) on the all-time list. Hasay followed that up with her third straight State Division V title. Her time of 17:05 was the second fastest time of the day just behind the 17:04 of Christine Babcock of Woodbridge (Irvine), who won the Division II race. In her upcoming senior year she will be shooting to join Sara Bei of Montgomery (Santa Rosa) at the only athlete to win four individual cross country titles. Hasay finished her season by winning her third straight Foot Locker West Regional race and then placing third in the national finals the next week in San Diego. Elizabeth Apgar (Lincoln, San Diego)—Moved up from Division V, where she finished third for Calvary Christian (San Diego) in 2006, to Division II, and again finished third after winning the San Diego Section title. Stephanie Barnett (Leland, San Jose)—Finished eighth in State Division II race after winning the Central Coast Section title over the tough Crystal Springs course. Sophomore all-state first team in 2006. Jennifer Bergman (Valley Christian, San Jose)—Won the Central Coast Section Division IV title and then she finished second at State. Freshman all-state first team in 2005. Katy Daly (St. Ignatius, San Francisco)—State Division II champion after placing second in the Central Coast Section final to a teammate.Freshman and sophomore all-state first team in 2005 and 2006, respectfully. Alex Dunne (San Clemente)—The No. 1 junior in the State Division I race with an eighth place finish after finishing seventh in the Southern Section final. Sophomore all-state first team in 2006. Jordan Hasay (Mission College Prep, San Luis Obispo)—Won her third straight State Division V title, with the second fastest time of the entire meet, after winning her third straight Central Section crown. Won the Foot Locker West Regional and the next week finished third in the national meet in San Diego. Earlier she won the Mt. San Antonio Invitational Grand Sweepstakes race. [, the latter with a time of 16:42, to move into fourth on the all-time list. Hillary Hayes (Edison, Huntington Beach)—After being slowed by injury, she came on strong with a seventh place finish in the State Division II race after placing sixth in the Southern Section final. Sophomore all-state first team in 2006. Maria Malone (Folsom)—Ninth in the State Division I race after a runner-up finish in the Sac-Joaquin Section final. Freshman all-state first team in 2005. Kevyn Murphy (Mira Costa, Manhattan Beach)—Has had to work through a series of nagging injuries over the last two years. She was just 16th in the Southern Section Division II final but had a come-through ninth in the State final. Named Freshman and Sophomore all-state first team in 2005 and 2006. Samantha Silva (Our Lady of Peace, San Diego)—Second in both the San Diego Section and State Division III races. Justine Fedronic (Carlmont, Belmont)—Lost the latter part of her track season but came back with a great harriers season finishing 26th in the State Division I race after winning the Central Coast Section title. Sophomore all-state first team in 2006. Staci Foster (Lutheran, Orange)—Placed sixth in the State Division III race after a runner-up finish in the Southern Section final. Diana George (Livermore)—Finished 14th in the State Division II race after finishing third in the North Coast Section. Brianna Jauregui (Saugus)—Place 22nd in the State Division I race for the team champion and was 25th in the Southern Section final. Nicole Mendoza (St. Francis, Sacramento)—Finished 16th in the State Division II race after a fifth-place finish in the Sac-Joaquin Section final. Jessica Nunez (South Hills, West Covina)—Placed 13th in the State Division II race after a sixth-place finish the Southern Section final, in what was probably her best race of the year. Lauren Peterson (Galt)—Was 20th in the State Division I race after an eighth place finish in the Sac-Joaquin Section final. Anne Randall (Saugus)—Finished 21st in the State Division I final but her best race might have been a ninth-place finish in the Southern Section final. Mary Reynolds (Mountain View)—Placed 16th in the State Division II race after a fifth-place finish in the Sac-Joaquin Section final. Sheree Shea (University City, San Diego)—Finished fourth in the State Division III race after a third place finish in the San Diego Section final. Tori Bateman (Chino Hills)—Placed 16th in the Southern Section Division I final in 18:06 but did not advance to state. Ximena Cruz (Trabuco Hills, Mission Viejo)—One of three third-team members for the third-place team in the State Division I race, she finished 38th , after placing 35th in the Southern Section final. Samantha Doughorty (Union Mine, Shingle Springs)—Placed 11th in the State Division III race after placing second in the Sac-Joaquin Section final. Caroline Draper (Rancho Bernardo, San Diego)—Finished 29th in the State Division I race after just a ninth-place finish in the San Diego Section final. Lori Huffman (Trabuco Hills, Mission Viejo)—Placed 37th in the State Division I race after placing just 44th in the Southern Section final. Annie Lee (Stevenson, Pebble Beach)—Finished third in both the State Division IV race and the Central Coast Section final. Jenny Mallon (Newbury Park)—Finished 12th in the Southern Section Division II race in 18:03 but did not advance to the State meet. Kathleen Miller (Gilroy)—Placed 31st in the State Division I race after finishing second in the Central Coast Section final. Sabrina Rathor (Trabuco Hills, Mission Viejo)—Placed 36th in the State Division I final after finishing 25th in the Southern Section final. Shadeh Tabatabai (Mira Costa, Manhattan Beach)—Finished 19th in the State Division II final after placing 10th in the Southern Section final. The magic continued for the Foothill junior year athlete through the end of the Fall Cross-Country season, as he emerged the winner over a talented group in the State Meet at the Division I level in a fine 15:13 clocking at Woodward Park. Chris seemed to add to his “tool-box” of racing skills this Fall the ability to consistently run along with talented packs and put a tough hammer down when the going became tough near the end of races. He was able to pick up that super valuable junior year experience of participation in the national individual championships in the sport, and brings an interestingly refreshing attitude to his discussions of running that would lead us to believe much bigger things are possible and will not surprise us from this Bakersfield area star. –Isaac Chavez (Barstow-SS) - Helped lead the Barstow Division III State Champions with a fifth in that competition, and has the potential to lead the best squad in the school’s history with some determined work for Coach Jim Duarte. –Nohe Lema (Willow Glen, San Jose-CCS) - Follows nicely in Mohamed Abdalla’s footsteps at Willow Glen, closing down his Fall with great fifth place (section) and seventh place (state) Division III runs. –Jose Lezama (Leuzinger, Lawndale - SS) - Talked off the soccer pitch partway through the Fall and amazed with efforts through a ninth at the Southern Section Division I run and tenth at the State Meet. Very tough runner who with a year of focused training could be tough to catch. –Emmanuel Ngula (Vista del Lago, Moreno Valley-SS) - Sub 1:55 800 runner with a smooth stride stepped into the Fall sport and really impressed with late season runs. He was the Southern Section Division II Champion and third at the State Meet and could be the surprise of the spring track season at 2 or 4 laps. –Jonathan Sanchez (Buchanan, Clovis-CE) - Leads the magic Buchanan class of 2009 that has the tough area star Sanchez and state team title in their sights. Jonathan was second in the Section to Chris Schwartz and twelfth at the State Meet. –Chris Schwartz (Foothill, Bakersfield - CE) - State Division I champ had a super fall season that culminated with competition at the national championship level as an individual. Tested himself nicely against all the challenges of the season that should make for a great last year and a half of prep running. –Renaud Poizat (Arcadia-SS) - Leader of what should be a fine San Gabriel Valley area squad next Fall. Renaud was 11th in the Southern Section Division I Finals and fourteenth at the State Meet in leading his squad to a eighth place finish with four underclassers on the Varsity. –Zack Torres (Crescenta Valley, La Crescenta-SS) - State’s frosh runner of year two seasons back bounced back to near the top of this class with a great season that had him fifth at the Section level and sixth at state. Rare all-state level two sport star with trip to Babe Ruth World Series through late summer before the Fall CC season. –Tyre Johnson (Palma, Salinas-CCS) - Central Coast Section Division IV Champ stepped it up nicely to run a fine second behind German Fernandez at that level statewide. Tough hard worker who showed impressive improvement since last Fall and Spring that should translate into some fine spring track efforts. –Tyler Valdes (Dana Hills, Dana Point - SS) - Helped lead his Orange County squad to great Section and State meet races with a third locally and fifth at state finals run while leading the race to pick up the team title trophies in those two tough affairs. –James Cameron (Mission Viejo) Couple of sub-15:20 efforts at the Southern Section championship facility and a thirteenth place in the Section Finals earned this talented Orange County star a spot on the second team. –Andres Diaz (Loyola, LA-SS) - One of the leaders of the State Division II Champ Loyola squad, Andres was fifteenth at the Section level and stepped it up to thirteenth at State. Four return for the Loyola Varsity from State who capped their season with a fine ninth as a club in the Nike Team National Championships. –Chris Haworth (Kennedy, Sacramento-SJ) - Fine overall season from the tough Sac Joaquin Division I, with a fifth place individual finish there and twenty-sixth at the State Meet at that level. –Wyatt Landrum (Liberty, Brentwood-NCS) - North Coast Section runner-up this Fall was a fine twenty-fifth statewide Division I at the State Meet run. –David Moonan (Dana Hills, Dana Point-SS) - Ran third at State for the Team Champions Division I with a thirty-ninth place finish at the section level and thirtieth at state. With four varsity returnees for DH in 2008 there is motivation to work hard with another trip towards that victory stand very possible. –Noe Ramirez (Vista Murrieta, Murrieta-SS) - Great close to his eleventh grade year for the State’s third place finishing Division I squad, with an eighteenth place finish at the section meet and twenty-fourth at State. We are already looking forward to those spirited Southwestern League battles with Murrieta Valley next fall. –Andrew Romano (Barstow-SS) - Another star who will be part of a super squad in 2008, Romano improved nicely from his soph year to seventh this campaign at the Southern Section Division III Finals and tenth in the State Finals run. –Garrett Seawell (Woodcreek, Roseveille-SJ) - Part of that aggressive front-running Woodcreek pack Seawell was second at the Section level his junior year and fourteenth at State for the third place Timberwolf group. –Cody Schmidt (Redondo Union, Redondo Beach-SS) - Continues his solid career with a runner-up performance Southern Section Division II to Emmanuel Ngula, and twelfth at the State Meet. –Ryan Valdes (Dana Hills, Dana Point-SS) - Fourth runner at State for the Division I titlests in thirty-second place, Ryan is one of four from his team back from that race at 16:07 or better to make them an immediate highly-ranked 2008 squad. –Pedro DeAlba (El Rancho, Pico Rivera-SS) - 15:52 at the Clovis Invitational at Woodward Park, and top thirty finish Southern Section Division I with a sub-15:30 clocking there. –Jesse Arellano (Madera-CE) - Jesse had a strong fall season for the traditional Central Section power. Arellano was twelfth in the Central Section finals and thirty-ninth at the State meet at under 16:00. Had a fine series of season-long efforts. --Mac Fleet (University City, San Diego-SD) - Foot Locker National level performances with big-meet wins over a number far up this grade all-star list prior to late season surgery that eliminated the end of the year for the nation’s #4 returning 1600 runner at 4:08.09. –Collin Jarvis (Rancho Buena Vista, Vista-SD) - After missing his section meet came back nicely at State right at 16:00 with a fortieth place finish to lead his seventh place Division I squad that returns a solid five to make 2008 worth working hard for. –Dan Mitchell (Del Campo, Fair Oaks-SJ) - Had fine season behind team leader James Tracy this Fall, Mitchell will carry the Del Campo banner into 2008. Was third at the Sac Joaquin Section Division II Championship race and fifteenth at the State Meet at under 16 minutes, a nice near minute improvement from his 2007 state meet effort as a soph. –Sterling Lockert (Petaluma-NCS) - Leader of the State Division II runner-up Trojan squad with a sixteenth place finish individually. Sterling was the North Coast Section individual champion with the Petaluma group returning five from the State meet to become an immediate threat in 2008. –Edwin Rodriguez (Wilson, Long Beach-SS) - Top thirty Southern Section Division I in November with sub-15:20 best there and good regular season earn this Moore League star a spot on the squad. –Simon Schmidt (Redondo Union, Redondo Beach-SS) - Top fifteen Southern Section Division II with 15:30 best on that facility this Fall. –Danny Vartanian (Buchanan, Clovis-CE) - Second runner at State for the Central Section Champ Buchanan squad at under 16:00, with a seventh place finish at the Central Section finals. After a first section title this Fall, Buchanan will press hard towards a first state win next November. –Lance Wolfsmith (Sobrato, Morgan Hill-CCS) - Fine third in the CCS Division III Finals and some great regular season runs earned the talented triathlete a spot on the team. What a difference a year makes. In 2006, Marvin finished 21st in the State Division II meet in Fresno with a personal best of 18:35 and then won the Foot Locker West Regional freshman race in 19:21. One year later she placed third in the State Division I race with a time of 17:33 to become the tenth fastest freshman ever over fabled 5,000-meter Woodward Park course. One week later Marvin turned in what was probably her best race of the year with a 17:37 fifth-place finish in the Foot Locker West Region final to qualify for the national finals in San Diego, where she finished 38th after suffering with stitches for almost the entire race. The first indication, this season, that Marvin was ready ‘run with the big girls’ came at the Clovis invitational where she placed second in the Division I race with a school record of 17:49. Two weeks later in the Mt. San Antonio Invitational Super Sweepstakes race she finish sixth with a time of 17:20. The top three finishers—Jordan Hasay (Mission College Prep, San Luis Obispo), Jessica Tonn (Xavier Prep, Phoenix) and Laurynn Chetelat (Davis, Ca. )—turned out to be the same three runners, who would finish, in that order, at the Foot Locker West Regional. On the track last spring, Marvin opened her freshman year with a 10:58.0 in March at the Azusa Distance Carnival 3,200 and closed it with an eighth place finish in 10:39.84 to rank just outside the top 50 in the nation. Do you think that Meghan just might be looking forward to the upcoming track season? Teena Adams (Esperanza, Anaheim)—Led the runner-up State Division I team with a 13th place finish after placing tenth in Southern Section final. Nicole Hood (Carondelet, Concord)—Capped an outstanding season with a fourth place finish in the State Division II race after winning the North Coast Section Division II race. Freshman first team in 2006. Meghan Marvin (Clovis)—When thing mattered most she stepped up with a third-place finish in the State Division I race and then placed fifth in the Foot Locker West Regional meet. Freshman first team in 2006. Liberty Miller (Simi Valley)—In the post Anna Sperry era at Simi Valley, she has been a worthy successor with a 12th place in the State Division II race after finishing fourth in the Southern Section final. Megan Morgan (Torrey Pines, San Diego)—Backed up her solid freshman season with a 14th place finish in the State Division I race and after finishing third in the San Diego Section. Freshman first team in 2006. Amber Murikami (Saugus)—Almost always in the top five for the nation's No. 2 ranked team, she placed 19th in the State Division I race and was 19th in the Southern Section final. Jacque Taylor (Casa Grande, Petaluma)—Last years Freshman of the Year had another outstanding season with come-through second place finishes in both the State Division II and North Coast Section races were previewed by a fourth place finish in the Mt. San Antonio Invitational Division I-II sweepstakes race. Melissa Skiba (Oak Park)—She was just 16th in the Southern Section Division III but roared like a lion with a fifth place finish push at State to lead her team to a second place finish. Sierra Vega (Chaparral, Temecula)—One of the surprises of the season, she placed third in the Southern Section Division I final with a outstanding 17:17 before finishing 11th in the State final. --Saylah Barserian (Clovis)—Second in the Central Section Division I race and 28th in the State meet but earlier ran an outstanding 18:08 in the Clovis Invitational. --Amber and Breean Collier (Woodcrest Christian, Riverside)—They could well have been mistaken for a legal firm, and they really laid down the law in the State Division IV race with Amber, in fourth and Breean, in fifth, to lead their team to a second place finish. Amber and Breean were second and third, respectively, in the Southern Section final. --Heather Cerney (Carondelet, Concord)—Finished 17th in the State Division II race after placing fifth in the North Coast Section final. --Catherine Hasbrouck (Nordhoff, Ojai)—Finished fourth in the Southern Section Division IV final and then repeated that place in the much tougher State final. --Bailey Miller (West Ranch, Stevenson Ranch)—Ran 18:15 in the Southern Section Division I preliminaries but that placed her just fifth in her heat so she did not advance. --Sarah Pearson (La Reina, Thousand Oaks)—Just like Hasbrouck, she was fifth in both the Southern Section and the State Division IV races. --Tarra Rorick (Paloma Valley)—Another victim of the tough Southern Section, she finished seventh in her heat of the Division I race in 18:21 but did not advance to final. --Kelsey Tippets (King, Riverside)—Had outstanding 18:10 and 18:13 in the Southern Section Division I prelims and final but was not a top six individual so did not qualify for State. --Steph Uriestegui (Atwater)—Third in Sac-Joaquin Section Division II race but not listed in the State meet results. Earlier was second in the Stanford Division II race in 18:27 and ran 18:34 in the Clovis Invitational. 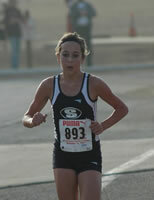 --Jenna Carpenter (Chino Hills)—Finished 30th in the Southern Section Division I race but did not qualify for State. --Lauren Curtin (Maria Carrillo, Santa Rosa)—Placed just 19th in the State Division III race but won the North Coast Section final with an 18:11 (worth sub 19:00 at Woodward Park). --Carley Gross (Foothill, Santa Ana)—Finished 26th in State Division I race after placing 24 in the Southern Section final. --Kathryn Gullickson (Dana Hills, Dana Point)—Placed 62nd in the State Division I race after finishing 66th in the Southern Section final. --Samantha Hamilton (Half Moon Bay)—Finished 13th in the State Division IV race after a second in the Central Coast Section final. --Colleen Lillig (California, San Ramon)—Was just 70th in the State Division I final but won the North Coast Section race with a 17:54 (worth sub 18:50 at Woodward). --Carina Mendoza (Madera)—Placed 57th in the State Division I race after finishing seventh in the Central Section final. --Erin Menefee (Mt. Carmel, San Diego)—Finished 28th in the State Division II race after placing third in the San Diego Section final. --Hayley Scott (Oak Ridge, El Dorado Hills)—Placed 31st in the State Division II race but ran 19:16 to finish second over the very tough Sac-Joaquin Section course. --Jovita Trujillo (North Monterey County, Castroville)—Finished 16th in the State Division III race after a fifth-place finish in the Central Coast Section final. NOTE--Bailey Miller (West Ranch, Stevenson Ranch), listed as a freshman in the Souther Section Preliminary results, is in fact, a sophomore and has beenmoved from the freshman to the sophomore team; due to a miscommunicatiton Katie Durant of Marina was left off the third team and has now been added to the third team. A year ago Jose Madera finished his frosh season for his Anahem squad at the Southern Section Prelims, where he was 67th in his Division I heat for his squad, a fine performance for a ninth grader. He obviously went to work since that time, leap-frogging himself over a fine group of other first year runners who had run much faster in 2006 to the head of his class by the end of his soph year, showing great momentum during the regular season and finishing the championship portion in magnificent style, moving into the very select top fifteen all-time on the Woodward Park course on the way to a ninth in the State meet at 15:31. –Travis Edwards (Royal, Simi Valley-SS) - Top twenty-five finisher in Southern Section Division I contest who will help lead the Royal charge back towards the top of the team scoring in the next two years. –James Goldstein (Oak Park-SS) - Top fifteen finisher Statewide Division III in helping lead the runner-up Eagle squad to another award winning effort. Very consistent runner. –Jose Madera (Anaheim-SS) - Super improver in a year ended with Jose ninth at State Division I in a fine 15:31 clocking that put him among the top fifteen in State Meet course history. 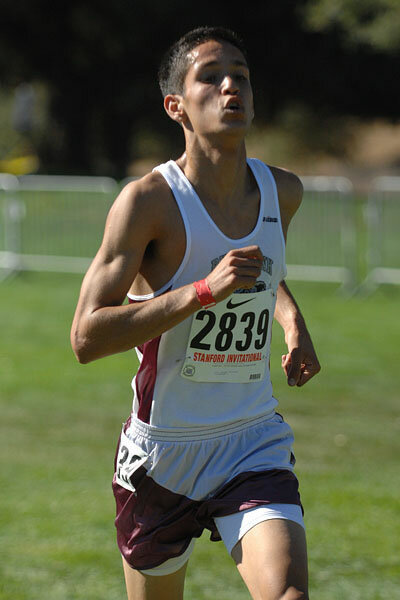 –Philip MacQuitty (Palo Alto-CCS) - Finished in the top dozen Statewide in the Division II Championship race. Phillip was the nation’s fastest frosh 3200 runner last spring in track at 9:11 and continued his fine career with a Central Coast Section individual title in a classic duel with Garrett Rowe from this list. –Heath Reedy (Buchanan, Fresno-CE) - Great overall soph season including this level’s #4 clocking of year with 15:43 for fourth individually in the strong Central Section Division I finals race. He helped lead his team to their first ever Section title this November, and with a ton of returnees will hope for the same success two weeks later at state in 2008. –Matt McElroy (Edison, Huntington Beach-SS) - Super year with top ten finish in Southern Section tough Division II title run, blazing a sub-15:20 on that area’s Championship venue course. –Jacob Roach (Otay Ranch, Chula Vista–SD) - Second in tough San Diego Section Division I finals run and top thirty-five at State in leading his thirteenth place team in Fresno in November. –Daniel Rosales (Apple Valley-SS) - Last year’s frosh runner of the year statewide continued his fine career with an eighth place Division II statewide at the end of the Fall. He was fifth in the competitive Southern Section D2 Finals race. –Garrett Rowe (Mountain View-CCS) - Another super young runner at Mountain View HS who was fifth place Division II statewide and fine second in his Section finals run to fellow soph Philip MacQuitty. –Parker Stinson (Rancho Bernardo, San Diego-SD) - Top twenty Statewide Division I in that Championship run with a fine third in the tough San Diego Section Division I finals race. Super overall season. Just off top twenty all-time tenth grade at Woodward Park. –Matt Airola (Bret Harte, Altaville-SJ) - Matt continues his fine career for the Bullfrogs with a sixth place State Division IV run and second behind German Fernandez in his own area this Fall. –Corey Coates (Davis-SJ) - The third finisher for the very young Davis HS Section titlest group this Fall, Corey had a top dozen Section Finals run and good series of championship efforts. –Drew Dalton (Vista Murrieta, Murrieta-SS) - Super run for one of the State’ newer powers in the sport, stepping up mightily in the State meet to run #4 for the State’s third place Division I finishers. –Dustin Fay (Rim of the World, Lake Arrowhead-SS) - Top thirty Statewide at under 16:20 at Woodward Park, Fay had a series of great runs come championship time with a tenth place Southern Section Division III run. –Carlos Martinez (St. John Bosco, Bellflower-SS) - Top twenty Southern Section Division II for the St. John Bosco soph who continued his fine career for the area power that returns three strong tenth graders. –Josh MacDonald (Redwood Christian, San Lorenzo-CCS) - Section V CCS Champ stepped up to the challenge at State, with a seventh at State Division V run at under 16:20 at Woodward Park. --Erik Olson (Novato-NCS) - Top twenty Division III Statewide this Fall, Erik was fifth in the North Coast Section Championships and had a fine tenth grade season. –Kurt Ruegg (Napa-SJ) - Super third placer in the Sac Joaquin Section Division I Finals, Kurt topped a fine overall season with a 16:13 run at the State Meet. –Johnny Sanchez (Roosevelt, Fresno-CE) - Top fifteen in the tough Central Coast Section, his time very close to 16:00 was not able to move on to the state meet on the Woodward Park course. –Danny Thomas (Arroyo, San Lorenzo-NCS) - Seventh in the North Coast Section Division I Championships, Danny followed that with a good State Finals run of 16:15. –Amjed Aboukhadi (Oak Ridge, El Dorado Hills-SJ) - Forty-second placer State Division II for the ninth place Oak Ridge squad, where he was the #2 runner. Added a fine ninth place in the Sac Joaquin Section meet in his division, with a fine series of runs during the regular season. –Dalton Guthrie (Bellarmine, San Jose - CCS) - One of the leaders of a young and improving Bellarmine squad this past Fall, Dalton was a fine 11th in the CCS Finals Division I. –Zach Kaylor (Enterprise, Redding - No) - Part of a great young group from the Northern Section this Fall, Zack was fourth individually overall in that area in their championship meet, and sub 16:35 Division III at the State Meet in Fresno. –Sean Krinik (Valencia, Placentia - SS) - Great close to his year and clutch effort as the fifth Scorer in State Meet for sixth place Valencia squad with 16:25 clocking. –Mitch Moriarty (Aptos-CCS) - Top forty finisher at State Divison III after a tenth in his Section meet at that level. The #3 finisher for a third place statewide Aptos squad that returns six of their seven for 2008. –Jayson Perez (South El Monte-SS) - Top dozen Southern Section Division III, Jayson went to state and backed down from no one during a fine 16:20 State Meet run and top thirty-five finish in his division. –Bryce Rausa (Vista Murrieta, Murrieta - SS) - Another young star for this power out of the tough Southwestern League as the fifth scorer and third underclass star in the top five for the State’s third place finishing Division I squad. 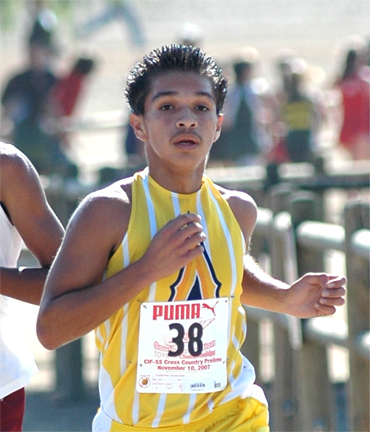 –Pablo Rosales (San Pedro - LA) - Super third place in the LA City Finals this November, Pablo was sub 16:35 at the State Meet in Fresno Division I. –Dillon Shaw (Davis - SJ) - Davis HS has a super young group of runners with Dillon the #4 scorer for the Sac Joaquin Section Champs at State as they finished in 11th with four frosh-soph in the six they have returning for 2008. He was individually 22nd in the tough Sac Joaquin Section Division I Finals run. –Alex Summers (Granada, Livermore - NCS) - Fine 8th place individually in the North Coast Section with some other strong runs during the regular season for his team. In a ‘fairy-tale’ first year of prep running, age-group star Elias Gedyon, who had starrred up through the 400-800-1500 distances in track as a pre-high schooler, stepped up to the three mile/5000 meter distance in fine style with a great Loyola team, marking his season end with trips to the victory podium at the Section and State Meet, and super job with his club squad at the Nike Team Nationals. With a loping stride that should spell for some amazing things come the spring track season after the strength he gathered this Fall, he typically started his harrier contests this season a ways back in the pack and showed impressive ability to maintain momentum and steadily move up through the field. His fine Woodward Park state meet run of 15:45 for seventh Division II in leading his team to the title is the #7 clocking ever for a ninth grader on the layout, with two of those ahead of him on that listing eventual National Cross Country Champions at the prep level, and one an eventual NCAA Division I titlest. If his interest stays high some great things could happen with his running before his prep career is over. –Chris Brewer (Rancho Buena Vista, Vista) ended as the sixth runner in the state meet for one of those Division I dynamite squads, Chris was inside the top dozen individually Large schools in San Diego. –Nathaniel Christan-Murray (Foothill, Santa Ana) - Latest of the super young runners to emerge at Foothill HS in Santa Ana, Nathaniel had a great Fall, culminating in a 41st at the State Meet to help lead his squad to a sixth place Division II finish there. –Dominic D’Aquisto (Enterprise, Redding) - Northern Section Champ had a great first year! He was 25th Division III in the State Meet, and will continue to improve. –Michael Gauger (Corona) - Great first year in the sport. Part of the very tough Southern Section Division I fields will continue to develop as he was top fifty in that very, very tough division. –Elias Gedyon (Loyola, LA) - Age-group star let no one down his first year as a prep in helping lead Loyola to a State title. His loping stride, which powers sub-50 second 400 speed, seems more suited to the oval in track, so look out this spring. –Parker Schuh (Mountain View) – Newcomer on the fine program Coach Evan Smith is building at the CCS school who steadily improved all through the season to 50th place Division II Statewide. His fifteenth place squad should march up the ladder in the next few years with a great group to train with as four of the team’s top five are frosh/soph. –Sean Upson (Royal, Simi Valley) - Couple of fine end of season races with right at 16:00 on the Section’s Championship course down south, with a fine group of other young runners in the program as one of the state’s top programs will battle towards the top in the next couple of years. –Andrew Ward (Torrey Pines, San Diego) - Fine San Diego star was top fifteen in his own section before leading his team into the state meet with a fine sub 16:25 on the Woodward Park course in the tough Division I Finals contest. –Heydon Woof (Camarillo) - Talented first year runner buried in the tough Division I of the Southern Section was right at 16:00 during Section Championship action on that facility. –Trevor Halsted (Davis) - Finished as a top five scorer for the eleventh place Boys Divison I state Finalist squad. One of six underclassers on the team who will make a big move in 2008. –Daniel Hawkins (Los Osos, Rancho Cucamonga) - Fine effort marked season end at the Section level with a sub-16:20 effort for the first year Baseline League star. –Sean Grumney (Newbury Park) - Fared nicely as first year runner in one of the State’s toughest leagues, the Marmonte from greater Ventura County, with a fifteenth place finish in that competition. –Chris Kigar (El Camino, Sacramento) Super fourth at his Section Division III Finals, and was inside the top sixty at the State Meet Division III at sub 16:45 as the third runner on a team that returns its top five in search of a place much higher than its twentieth in 2007. –Amar Moussa (Arcadia) - Steady improver ended up number five scorer at State for Coach Jim O’Brien’s fine eighth place Division I 2007 squad. Should help lead the program’s “re-load” in 2008. –Matt Neev (Laguna Beach) - Super run at State to finish 20th and to help lead his sixth place Laguna Beach team that has great future, as does Matt, with five frosh-soph onthe 2007 Varsity. –Sam Pons (South Pasadena) - Top thirty Southern Section Division III this Fall, Sam marked a couple of season ending efforts right at 16:00 on that area’s championship facility. –Chris Reis (St. Francis, Mountain View) - After loping to a fine WCAL League Frosh-Soph title, Chris stepped up to run against the big boys, surprising with a top fifteen placing at the CCS Division II Finals run. --Myles Scarano (Woodcrest Christian, Riverside) - Gradually and carefully blended in nicely with the State Champion Division V varsity group, ending the season 14th State Division V and the #3 scorer for the titlest squad that returns a solid foursome in seeking another win in 2008. –Benjamin Xie (Oak Ridge, El Dorado Hills) - After a fine individual 16th place Division II in Sac Joaquin action, Benjamin was the #4 scorer for his ninth place squad at State with a sub-16:50 effort at Woodward Park. –Dylan Alexander (Highland, Palmdale) - Super start to his Fall. Still ended as one of the top frosh in the tough Southern Section. –Jeff Bickert (College Park, Pleasant Hill) - Top thirty Division I in the North Coast Section this Fall with a fine effort. –T.J. Brown-Pinizzotto (Jesuit, Sacramento) - Number of super efforts during the season with 16:08 at Clovis Invitational and 16:14 at Stanford Invitational. –Eric Gelfhi (Redding Adventist) - Finished fine sixth place in the Northern Section, with a couple of top ten Invitational finishes along the way in strong Varsity fields. Eric and the three frosh-soph runners in front at the Section meet probably make up the Northern Section’s top group of young runners in history, with some great running the next few years. –Hailu Hitchman (Mater Dei, Santa Ana) - Ended the third runner at under 17:00 for a very young Mater Dei squad at State Division II, a group that will improve along with this star over the next couple of years. --Steven Mandau (Westmoor, Daly City) - Fine top twenty-five finish Boys Division II in the Central Coast Section. –Elliot Myers (Esperanza, Anaheim) - Another of the many young top runners on both the Boys and Girls side from the Southern Section’s Sunset League, closed his October and November with a couple of very good runs at the Section course site. –Marco Perez (McFarland) - Had fine overall year for very young McFarland team that will be back in 2008 with Marco and a ton of talented returnees. –David Rosales (San Pedro) - Had a couple of great races at the end of the season, with a top ten run individually in the LA City Finals, and was fourth in the Frosh race at the Foot Locker West Regional. –Justin Vilhauer (Redwood, Visalia) Not many frosh athletes are a Section individual champ, as Justin pulled off in the Central Section Division III title run this Fall. Followed that with a fine run at the State Meet. The Buzz begin as Summer began to wind down. There was this new girl in the Santa Clarita Valley. She was running well and she was going to be a freshman at Saugus. Sure enough, at the season-opening Seaside Invitational in Ventura, Kaylin Mahoney made her debut, winning the freshman grade-level race with the third fastest time overall, and over the next three months she never slowed down. Just two weeks later at the Woodbridge Invitational Sweepstakes race she finished eighth and closed the margin on senior team leader Katie Dunn from one minute to just 23 seconds with an eighth place finish in the Team Sweepstakes race. Mahoney continued to improve until the two runners ran almost as one as the Centurions strung together wins at the Mt. San Antonio Invitational, the Southern Section and State Division I championship race and finally at the Nike Team Nationals in Portland, where, running as a Club team, they proved themselves to be the second best team in the nation. Mahoney’s seventh place time of 17:47 on the famed Woodward Park State meet course ranks her as the No. 9 freshman of all-time behind 17:02 list leader Jordan Hasay of Mission College Prep (San Luis Obispo) from 2005 and Deena Drossin of Agoura from 1987, and just in front of Kauren Tarver of Serrano (Phelan) from 2004. Considering that Mahoney run ‘just’ 4:50 for 1,500 meter and 10:50 for 3,000 meters last season as an 8th grader, and given her outstanding season just included, do you think that she could be looking forward to the track season? --Alaina Alvarez (Dana Hills, Dana Point)—The top runner on the States fourth-place Division I team finished 32nd in the State finals after finishing 18th in the Southern Section finals..
--Lyndsie Etherton (Bullard, Fresno)—Just fifth in the Central Section finals but improved 26 seconds on the same course to finish 33rd in the State Division I race. --Molly Grabill (Rancho Bernardo, San Diego)—Won the San Diego Section Division I race defeating the highly regarded Katy Andrews of La Costa Canyon (Carlsbad) and then placed 18th at State. --Jana Hayashi (Arroyo Grande)—Ran the equivalent of under 18:30 at Woodward Park but did not get out of the tough Southern Section Division I final despite finishing ninth. --Rachel Hinds (St. Ignatius, San Francisco)—Moved to California from New Jersey this year and won the Central Coast Section Division III meet before finishing eighth at State to help her team, which returns its top five, to a fifth-place finish. --Kaylin Mahoney (Saugus)—The top freshman in the state, opened up with an outstanding run at the Seaside Invitational and maintained her consistency throughout the season finishing seventh in State Division I race and help her team to the title. --Annie Mooney (Mission College Prep, San Luis Obispo)—With Jordan Hasay to show her the ropes, she made great strides this fall culminating in a second-place finish in the State Division V race. --Jessie Peterson (Carlmont, Belmont)—A welcome addition to the top team in the Central Coast Section, she finished 35th in State Division I race after placing sixth in the Section final. --Shanna St. Laurent (Rancho Buena Vista, Vista)—Ran 17:32 in the Mt. San Antonio Invitational and was possibly the best runner in the San Diego Section but she missed the Division I Section final due to sickness. --Hannah Valenzuela (Apple Valley)—Did not advance to the State Division I final despite finished 11th in the Southern Section final and running the equivalent of a sub 18:30 at Woodward Park. --Robyn Arnold (Redlands)—A great addition that helped push the Terriers, who finished eighth in the State Division I race, into the upper echelon with a 58th place finish in the State Division I race after running 45th in the Southern Section final. --Rebekah Bahra (Esperanza, Anaheim)—Finished 48th in the State Division I race to help the Aztecs to a second-place finish. She was 37th in the Southern Section final. --Melissa Bauer (Paraclete, Lancaster)—Maintained a low profile before winning the Southern Section Division IV title and finishing seventh at State. --Alli Billmeyer (Torrey Pines, San Diego)—As part of sixth-place team in Division I, was 41st at State after finishing seventh in the San Diego Section final. --Emily Birch (Escondido)—Another fine San Diego freshman, who finished 50th in the State Division I race after an 11th place finish in her section meet. --Paxton Cota (Dana Hills, Dana Point)—As the second of two freshman on the team, finished 44th in the State Division I race to help her team, which returns six of seven runners to a fourth-place finish. A week earlier she was 29th in the Southern Section finals. --Jackie Evans (Gunn, Palo Alto)—After finishing just 33rd in the Central Coast Section Division II race, the up and coming age-grouper finished 23rd in the State Division II race. --Jessica Feuerstine (Serrano, Phelan)—Another unlucky Southern Section athlete who did not make the State meet after running 18:14 and 18:30, respectively, in the Division I preliminaries and final. --Carmille Garcia (Fountain Valley)—Joined a very strong program, that finished seventh in the State Division I race, and became the teams No. 2 runner, finishing 45th at State after placing 21st in the Southern Section final. --Bailey Miller (West Ranch, Stevenson Ranch)—Ran 18:15 in the Southern Section Division I preliminaries but that placed her just fifth in her heat she did not advance. --Emma Dohner (Gunn, Palo Alto)—Placed 50th in the State Division II meet but finished seventh in the Central Coast Section meet. --Emma Freeman (Del Oro, Loomis)—Finished 22nd in the State Division III race, to lead her team to an 11th place finish after finishing fourth in the Sac-Joaquin Section final. --Ariane Gushue (Foothill, Santa Ana)—Along with her sister, moved this summer from Corona del Mar, and finished 33rd in the State Division II finals, for a team that finished second and returns five runners. --Dani Henry (Serrano, Phelan)—The second Serrano freshman to make the all-state team faltered slightly in Southern Section Division I final but ran 18:16 in prelims. --Marissa Horton (St. Lucy’s, Glendora)—Finished 17th in State Division III after finishing 11th in the Southern Section final. after finishing second in the North Coast Section finals. --Savannah Pio (Mira Costa, Manhattan Beach)—Helped the team, which returns five runners, to a fourth-place finish in Division II with a 44th place finish after placing 46th in the Southern Section final. --Tori Sarris (Newport Harbor, Newport Beach)—Placed 46th for the State Division II champions after a 22nd place in the Southern Section final. --Kelsey Santisteban (Castro Valley)—Placed 71st in the State Division I race and sixth in the North Coast Section Final. --Corissa Storms (West Valley, Cottonwood)—Capped a season long run with an 11th place finish in the State Division IV race to help her team to a eighth place finish. Placed fourth in the all-division Northern Section race.